Please refer to our stock # deLil29SN when inquiring. deLillo calls this his "Spider Necklace", and what a glamorous spider it is! Square cut clear rhinestones combine with large oval faceted crystals to form a very dramatic effect when this huge necklace is worn. 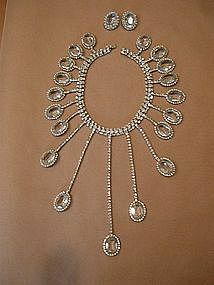 As with all the deLillo pieces on our website, this necklace was designed and executed by Robert Clark,former Chief Designer for Miriam Haskell and it was purchased from Mr. deLillo's personal archives. Circumference of the necklace is 15 1/2", center dangle is 7 1/2" long. Clip earrings are 1 3/8" by 1". deLillo name plate is on the clasp.